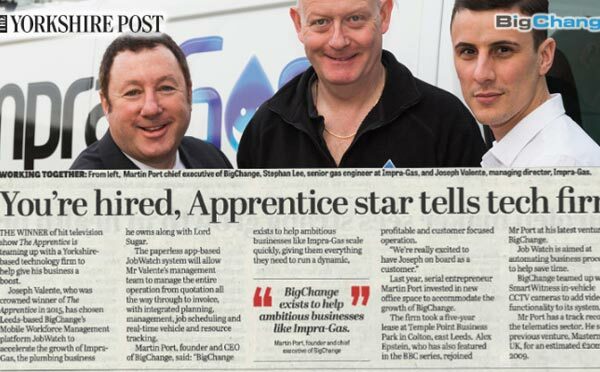 Joseph Valente, who was crowned winner of The Apprentice in 2015, has chosen Leeds-based BigChange’s Mobile Workforce Management platform JobWatch to accelerate the growth of Impra-Gas, the plumbing business he owns along with Lord Sugar. The paperless app-based JobWatch system will allow Mr Valente’s management team to manage the entire operation from quotation all the way through to invoice, with integrated planning, management, job scheduling and real-time vehicle and resource tracking. Martin Port, founder and CEO of BigChange, said: “BigChange exists to help ambitious businesses like Impra-Gas scale quickly, giving them everything they need to run a dynamic, profitable and customer focused operation. “We’re really excited to have Joseph on board as a customer.” Last year, serial entrepreneur Martin Port invested in new office space to accommodate the growth of BigChange. The firm took a five-year lease at Temple Point Business Park in Colton, east Leeds. Alex Epstein, who has also featured in the BBC series, re-joined Mr Port at his latest venture BigChange. Job Watch is aimed at automating business processes to help save time. BigChange teamed up with SmartWitness in-vehicle CCTV cameras to add video functionality to its system. Mr Port has a track record in the telematics sector. He sold his previous venture, Masternaut UK, for an estimated £20m in 2009.